The mental and emotional health of ourselves and those we care most about is a critical issue that impacts our homes, communities and our society. There is a great deal written about improving our mental and emotional health. There are countless resources available on how to be happy, handle stress, deal with the ups and downs of close relationships, etc. Also, in terms of therapeutic intervention, we (as a society) take a lot of pills to relax and be happy, a few adult beverages to unwind, and use some mind-numbing habits to avoid a few painful realities. Truth be told, even though most of us are not exposed on the front page of the papers, we all have our own “little helpers” to deal with some darkness in our lives. As we continue on our journey to build and strengthen our character, it is important for us to find the habits that can be the antidote to what currently plagues us. Our mental and emotional health and the impact that may have on those closest to us is too important to not make meaningful progress towards a cure. Giving is the universal antidote to what plagues us. The time to start is now, not when we think we have our house in order. In a world (and our homes) that continues to grow in complexity and uncertainty, we live in a constant state of change and our house most likely will never be in order. Time and Effort: Giving our time and effort to serve others in need is an effective antidote to the “busyness” that sometimes plagues all us and helps to deal with the time-wasting habits in our lives (we all have them). Studies would show serving others in need lifts our emotional state. It turns out that doing good makes us feel good. It does not have to be huge. Start small in the home like taking the trash out without complaining. Money: Giving financially, on a consistent basis, is an effective antidote to greed, the struggle to compare and “keep up with the Joneses” (or Kardashians) and naturally puts guardrails around “wants” vs “needs” in our lives. Studies would show if we don’t start now to give, we will just keep moving the goal post higher as we tell ourselves, “I will give once I reach a certain income level or net worth.” Spoiler-Alert: We never reach it as we always see the need for more. Find a cause and start giving now. Small, slow and steady. Talents: We all have some skills in life. They may not be the ones that will earn us a 10 year-$100 million contract for a professional sport, but we have some skills to offer to others. Some maybe be good coaches/mentors on the field or in the workplace. Experiences can always be shared with “newbies” to big items like parenting, moving into a new community, transitioning into a new grade at school or into a new job. Giving our talents (big or small) to help others is an effective antidote to feelings of insecurity and inadequacy that we all face. As we discipline ourselves to give regularly, we will take preventive measures to maintain our mental and emotional health in a challenging world. Giving will help to build and strengthen our character and Character Creates Opportunity® to reach our full potential and have a positive impact in our homes, communities and the world. There is a common path that we all journey on as we continue to build and strengthen our character. Despite how our world continues to grow more complex and uncertain in our homes, businesses and communities, we all share a common path. We do not journey alone, rather we journey together in relationship with others…whether we admit it or not. The enclosed graphic is an attempt to depict the common path that most relationships travel on towards a journey of health or harm. 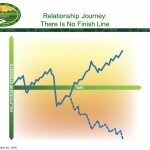 There is no finish line with regards to our impact on the relationships around us. Even in death, the legacy of our relationships lives on in the lives of those left behind. Every single important relationship in our lives endures some significant ups and downs. When we choose to guide our thoughts, decisions, and actions by principles like honesty, compassion, and sacrifice, we strengthen our character and our relationships. When we fail to guide our thoughts, decisions, and actions by those same principles, we weaken our character and our relationships. Whether you find yourself today on a high point or a low point on this graph with an important relationship, here are a few suggestions that I hope will be some support and encouragement to keep moving forward in building and strengthening an important relationship. Stay Hungry: One of the biggest threats to building and strengthening our relationships is when we get complacent and comfortable. When we deny the reality that our journey will be filled with ups and downs, we get comfortable and complacent in so-called “good times.” We fail to spend energy learning and growing in our relationships. When our bellies are full, the bills are paid, and the sun is shining, we still need to hunger after raising the bar on ourselves and our relationships by delivering on the basics: serving more than taking, understanding more than judging, and listening more than talking. Stay hungry. As we stay humble, stay hungry, and stay in the ring, we will build and strengthen our character and Character Creates Opportunity® to strengthen our relationships and have a greater impact in our homes, businesses, and communities. For many parts of the country the fall colors are in full display. Even though most of us are not farmers by trade, we can sense the abundance of harvest time during the fall season. 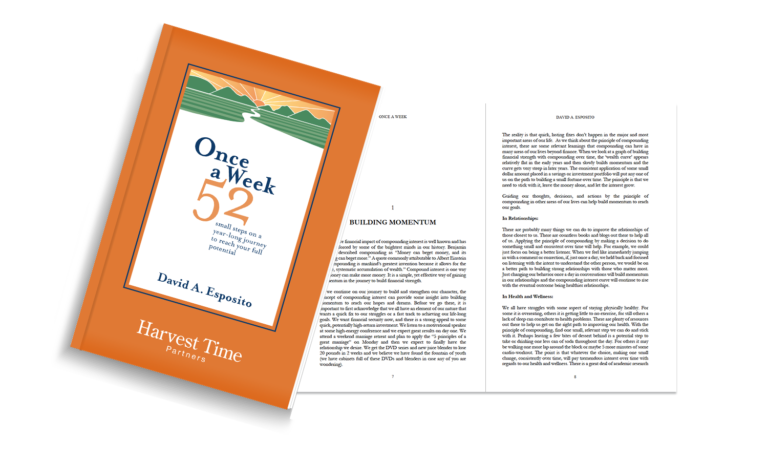 As we continue to build and strengthen our character, harvest time helps to remind us of an important truth that we have a tendency to forget during the seasons of life. 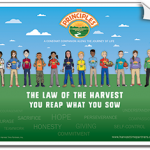 The fall season and the harvest time remind us of the one basic natural law that most directly translates into a relevant, practical, and universal truth necessary to accomplish our hopes and dreams: The Law of the Harvest; simply, you reap what you sow. The law of the harvest is the simplest and most powerful life transforming principle. Ironically, it is also the one that we need a consistent, steady reminder of its simplicity and truth during the twists and turns of our life’s journey. The law of the harvest, in the natural world, is as true as the law of gravity. If you want to reap an abundant harvest of corn or soybeans in the fall, there is only one pathway to follow: The Law of the Harvest. If we asked any farmer 2,000 years ago or one today in the fields of Iowa, we would get the same general response. There are no shortcuts to an abundant harvest. We must spend time in the winter to make a plan and prepare to implement when the spring comes. In the spring, we must prepare the ground and plant the seed. In addition, throughout the spring and summer, we must cultivate the fields through a long growing season. Then, and only then, will we reap an abundant harvest in the fall. If we want healthy relationships with those closest to us, the law of the harvest will be our judge. Are we vacationing all spring and summer with the expectation that relationships will be fine when tough times hit (friendly reminder…the tough times will hit)? Or are we doing the hard work today that looks like sacrifice, selfless service, and the humility to listen and learn? In our own personal development, the law of the harvest will always be our most steady path to lasting growth and accomplishment. If we want a more fulfilling career path, then we need to be intentional about making a plan and working the plan. If we are expecting someone in “management” to come and spoon feed us a fulfilling career plan, we may be waiting for a long time. If we want to maintain our physical, mental, emotional, and spiritual health, we need to make a plan and work the plan. Lasting health is built over time. The law of the harvest reminds us that there is no such thing as an overnight success in reaching our hopes and dreams. Despite our best efforts to adhere to the law of the harvest, there is the occasion when it just does not work out. Sometimes a storm hits and hail or heavy rains ruin a season of work. Similarly, in our personal lives, we can be genuinely giving our best effort to live consistently according to the law of the harvest and we experience an unfortunate and tragic end to a season of effort. In the most important areas of our lives, it is time to ask a most direct question, “Are we preparing to reap an Abundant Harvest?” In our character…marriage…parenting…friendships…careers…community? I hope we can all use this fall season as a moment of support and encouragement to apply the law of the harvest to achieve our hopes and dreams. As we become intentional about living according to the law of the harvest, we will build and strengthen our character and Character Creates Opportunity® to achieve our goals no matter what our present situation. Unfortunately, life throws us a lot of challenge. Some more than others and at various degrees of intensity, but on occasion we all have to peel ourselves off the canvas. Beyond our own troubles, many times we are faced with the opportunity to provide comfort to someone close going through a struggle. As we continue on our journey to build and strengthen our character, it is important to reinforce the power of presence compared to the words we say to comfort those in the crucible of life. Most of us are aware of the cold, hard reality that eventually it is our decision alone to make to move forward through a difficult experience or wallow in the struggle. However, we all need our moment to grieve. In the midst of comforting someone in a difficult spot, our presence is more powerful than our words. The academic research and our practical experience would remind us all that just being there is a source of comfort. Not spouting some philosophical wisdom or relating our own experience, but just our presence can aid the afflicted more than our “brilliant” speech. Our presence and our often our tears say much more than our words. For those of us who often feel anxious about what to say or what to do, it is important to be reminded that there is greater value and impact in just being present when aiding and comforting those closest to us. Just start with being there and let the journey begin. When we become self-aware enough to realize our words are not the most relevant source of comfort and we exercise the discipline to just be present to comfort those in need, we will build and strengthen our character and our Character Creates Opportunity® to be a source of comfort to those in a difficult spot.